FAI President Donal Conway and Ruth Ryan, Marketing Specialist with SSE Airtricity presents the Supporters Contribution Award to Tony Burke, left, and Patrick Lynn, right, from Waterford FC during the SSE Airtricity League Club Awards at Clayton Hotel in Ballsbridge. Photo: Matt Browne/Sportsfile. 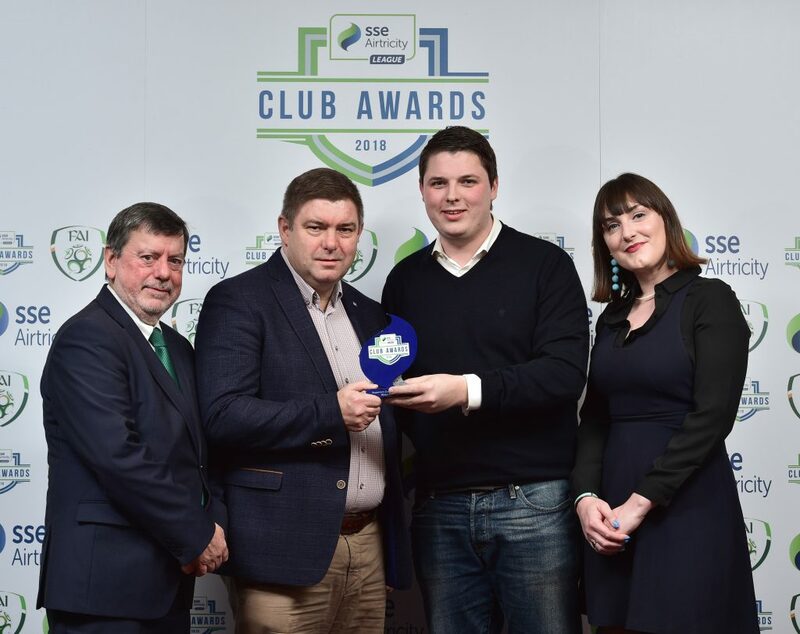 A remarkable first season back in the SSE Airtricity Premier Division was capped off at the SSE Airtricity club awards held at the Clayton Hotel in Ballsbridge over the course of the past week where Waterford FC were named Supporters of the Year. The award is richly deserved after the fans gave their all to support the club on and off the field during the 2018 season, but it wasn’t just travelling to away games and turning out in huge numbers at home as the supporters club over €9,000 for the club with transport costs for underage team and also sponsorship to the club. Speaking to the Waterford News & Star after winning the award, Shane Murphy, who put the application together said, “all Waterford FC fans are absolutely delighted to win the Airtricity League Supporters Contribution award because it’s recognition of how far we’ve come and the positive direction everyone is headed together. “There’s unbelievable momentum behind the Blues now and it’s all the sweeter after some very dark days for the club. We all appreciate how close the club was to catastrophe two years ago. The change in that short time has been incredible. There’s a buzz around the city and county for the Blues that hasn’t been matched for decades. “We’ve had incredible numbers travelling to away games and the atmosphere and behaviour of our fans has been commended wherever we’ve gone. There are more and more families travelling on the supporters buses now and the feedback from them is unbelievably positive. “Now that the club is on a more secure financial footing, fans have been able to put ideas into action that we always wanted, but were never in a position to accomplish before. We set up a Junior Blues club so young fans get to meet the players regularly, sometimes play football with them, get birthday treats and feature in the match programme. “The players and Alan Reynolds have been incredibly helpful with that and it’s one of the most positive developments at the club. There’s a great relationship between fans and the board and both are firmly focused on building the club up for the future too. “The Blues Supporters Club made a huge commitment this year by undertaking to pay all the travel expenses of the three Academy teams (under 15s, 17s and 19s). The support and goodwill from fans for that fundraising has been amazing because it helps talented young local players. And the positive reputation of the fans has helped us get great backing from local businesses too. “Best of all, the fans will be heading out to somewhere in Europe in big numbers next season and that’s just a dream come true for us. It’s phenomenal to see the support all around for the club. You see jerseys and gear being worn in any part of the county you visit. In a club statement, Waterford FC said, “Everybody at Waterford FC is delighted to see the Supporters Contribution Award being awarded to our fans at the SSE Airtricity League Club Awards last week. “This award is for all the fans who have been brilliant during the 2018 season. We’re seeing a fantastic atmosphere at our matches and the work that the Blues Supporters Club have done and are doing is having a great impact.